Every bullet fired at the mosque had at least three names on it: Muslim, Jew, Black. The dark, foreboding world of the far-right, replete with its own vocabulary, video games, and revisionist history, is an equal opportunity hater, at least insofar as those three groups. Their intended victims should naturally be drawn together. Whatever their differences, it makes sense for them to stand together against those who wish to physically annihilate them. That, however, won’t happen. It amounts to a separate tragedy. And while it seems that all civilized people, as they should, have expressed their outrage and pain over the horrific attack on the New Zealand mosques, this second tragedy will not even register. The coming together of Jews and Muslims won’t happen because of deep-seated hatred and mistrust. Too many Muslims come from cultures that have demonized Jews for a matter of generations, not just years. (That’s all Jews, not just Israelis. They are taught in extremist mosques around the world that Jews are the worst of people, and must be eliminated.) While these are not the majority of Muslims, neither are they an inconsequential number. They are a cultural force even upon those who disagree with them – except, perhaps, on the growing number who have gone secular since coming to the West. In many cases, the haters have never met Jews – which has made it easier to provide them with a diabolical stereotype of the Jew (it doesn’t matter that it is a complete fabrication), and they see every Jew as that stereotype. On the other side, the expulsion of hundreds of thousands of Jews from their homes in the Arab world in the years after the creation of the Jewish State, and the generations of terrorists and suicide bombers raised in the Arab and non-Arab Muslim world leave many Jews incapable of trusting Muslims, even if they would want to. This mimics the relationship between Jews and contemporary Germans. There is absolutely no question that there are now two generations of Germans who completely turned their backs in disgust on their own forbears. (I have personally met more Germans than I can remember who were consumed with guilt for something they did not do. Just a few weeks ago, I spoke to a group in Germany of liberal churchgoers. One person in the audience, almost in tears, exhorted the audience to take more seriously their guilt as Christians for the way their ancestors had treated Jews.) Yet, almost every Jew I know meets Germans in that country with a certain reserve, owing to one question: What was this person’s grandfather doing during the War? Similarly, Jews have difficulty in trusting people, when too many images of the evil committed by their relatives loom large in their minds. Does this person secretly wish to slit my throat, they ask? Many Jews as well look at a Muslim and see a stereotype. The situation is not helped by the new images that only reinforce the stereotypes. While there were pictures of Jews crying together with Muslims after the horrible attack, no Jews were observed handing out candy to motorists in Israel or Brooklyn to celebrate it. But that is not the case in the streets of Gaza after terror attacks on Israeli citizens. It doesn’t help that Ilhan Omar, the present head of the Congressional Office to Promote Anti-Semitism, comes from and represents a subculture far removed from Israel and Jews, but rife with Jew-hatred. (Her congressional district has contributed more volunteers who left the US and fought for ISIS and Al-Shabab than any in the country.) It does not help that CAIR – the organization that speaks loudest for Muslims in this country – is held by two Arab countries to be an extension of the Muslim Brotherhood – Iran’s competitor as the world’s leading exporter of terrorism. To be sure, individuals will escape those stereotypes, but it won’t happen on a large scale. Jews and Muslims – even in the West – will by and large be trapped by them. This is not the case, however, regarding Jews and Blacks, who also commonly occupy the space in the cross-hairs of the extremist right. (In the case of Jews, the left is also gunning for them – perhaps even more dangerously – but that is a matter for a different essay.) Here we may be able to get past the stereotypes, and forge a closer alliance. What had happened? In part, two communities fixated on stereotypes of the other. Too many Blacks saw all Jews as the occasional white landlord they despised. Or as the member of a minority group that managed, where they had not, to escape their poverty and powerlessness, and rise to seeming universal success – but exhibited what seemed to black people to be a paternalistic attitude towards them when they offered their help. The relationship was lopsided, and couldn’t last without resentment. Too many Jews, many/most still living in urban or sub-urban areas, saw all Blacks as the uneducated, fatherless criminals they encountered in life, or in the daily news. The old alliance completely unraveled, here too, aided by stereotypes. That’s the say it stayed for decades. Because of my work in Israel advocacy and interfaith affairs, I told them, I saw a possibility a few years ago for the relationship to pick up again. It would have to start with people of faith, like them. I asked them to consider two threats to their community. The first was the white nationalists of Charlottesville. The other was the white interviewer, before whom appear two equally qualified candidates for a job. He sees himself as unbiased. He would be horrified to be called a racist. However, he harbors some latent disquiet/hesitancy/hostility towards black people, and selects the white candidate. Which one was of greater concern to them? They readily admitted that it was the latter. There were far, far more people in the second group, and they daily inflicted harm inflicted upon Black aspirations. Moreover, because they insisted that they were not prejudiced, they often could not be guilted into dealing with their problem. I helped them along. Many millions of American whites can tell you about slavery, and about its abolition. They will tell you that it was a moral evil, and that we put it behind us. Mention Jim Crow, and they will insist that he was an infielder for the Red Sox. Or Sheryl Crow’s brother. Tell them about what Jim Crow did to American black people, and they will shut down the conversation by noting that we elected a black president. After Barack Obama, black people have nothing to complain about, they say. They are wrong, and ignorance is not the only cause of their error. Despite huge strides in overcoming prejudice, many Americans do not even realize that they still harbor unconscious rejection of black people – and that it disadvantages Blacks. Blacks and Jews, therefore, are two communities facing an uptick in death threats from the far right, while both understand that subtlety of a threat of undiagnosed hostility from a numerically larger part of the population. They should be coming together. What does this mean? If left uncorrected, there will be a new round of stereotypes. Many Jews will assume that Blacks, as a group, hate them. And, in the words of Proverbs, “As water mirrors the face that looks into is, so does the heart of man to man.” The rejection will be reciprocated, even among those who previously harbored no negative feelings – and the polls have them as the majority. This would be both morally wrong, and counterproductive to Jewish interests. We need all the friends we can get for the rough times ahead. We cannot squander the good-will of millions of Americans. What can be done? Plenty. If stereotypes are fed by images, we need to at least offset the ones that lead to rejection with ones that inspire acceptance. We should acquaint ourselves with the Black groups – especially conservative Black churches – that are pro-Israel. They include a not insubstantial number of people, who believe that Jews have a special place and special role according to the Bible. 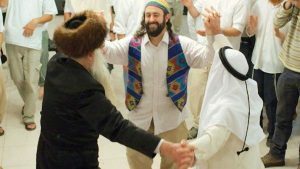 And we need to get those groups to meet real, live Jews – not stereotypes – especially Jews of deep faith. The fact that we all know of organized hordes who are trying to kill all of us can be an impetus to begin conversations that have not yet happened, and to build important two-way bridges of cooperation. A flawed analysis. The reason why my shul and most other shuls have stepped up security? Right wing hatred. Left wing hatred does not go into synagogues, mosques or churches and gun down worshippers–but white nationalist, right wing, gun toting hatred most certainly has and does. I will be going to a gathering at a local mosque later this week joined by worshippers of all faiths to stand with my Muslim brothers and sisters. My rabbi and other Jewish clergy have already met with local Muslim clergy at their places of worship. Among the hundreds of students I have taught in recent years a good number have been Muslim and I have the highest regard for them. We have wonderful discussions about all matters under the sun, and some have come to learn more about, and respect, Judaism in the process. Do not fall prey to the same stereotypes you yourself have mentioned in your piece. All of us who are victims of this right wing hatred see quite clearly that there is far more than unites us than divides us. This includes the current President who has emboldened right wing hatred–in the process he has brought many of us together to stand against him and the evil that he represents in this regard. The only thing that repeating the Right Wing Hatred mantra over and over again accomplishes is to openly display just how completely intolerant and full of hatred that the Left is. Plus, it is almost never even true that political conservatives participate in these mass murders. Virtually all of those acts are done by people on the Left, including the murderer of those Jews over in Pittsburgh. That murderer hates Donald every bit as much as the intolerant, hateful Left does. Furthermore, it is quite revealing of the Left’s mentality that they choose to focus on what happened in New Zealand, while completely disregarding the endless attacks on Christians, Jews, Hindus and Buddhists that are committed by the islamoNazis on a daily basis around the world. To the mind of the Leftist, the innocent lives of Black Christians that are stuffed out in sub-Saharan Africa do not matter, especially if the perpetrators of those crimes are the followers of Allah. Nor do Leftists give a darn when it is Black people murdering other Blacks on the streets of Chicago, Philadelphia, New York, and Baltimore. I do not know how much more pro-Israel that Donald needs to be before Jews on the Left stop hating him. Or maybe they hate him precisely because he is so strongly pro-Israel. Such is the thoroughly twisted mind of those on the Left. There are very few groups and individuals left on this earth that Trump has not insulted. He has insulted most of our longtime friends around the world but has nary a bad word to say about Vladimir Putin. He crudely insulted John McCain, a national hero, for being a “loser” for being a prisoner of war. He continues to insult him long after he has already died. He mocks invalid reporters. He insults women. He disparages immigrants. And in Charlottesville, where white nationalists were yelling “Jews will not replace us”, Trump says there are some very fine people on both sides. He aids and abets those who pick on the most vulnerable. Not so long ago we read Maftir Zachor. Amalek must be wiped out for the way it disgustingly attacked our most vulnerable members, women and children, from behind. This is what the white nationalists are doing–attacking the most vulnerable. Sitting in a house of worship, being a black church in Charleston, a Jewish synagogue in Pittsburgh or an Islamic mosque in Christchurch, and being gunned down while praying. It is no coincidence we have seen a stark rise in this activity since Trump was elected. Regarding your dispatch from over the rainbow …. Some comments could be said, but for brevity’s sake there will be one. Following the Pittsburgh massacre, the official BLM tweet acknowledged a shooting and had zero references to Jews and zero references to a synagogue. Denial comes in many varieties, it does. “Left wing hatred does not go into synagogues” – not (yet) in America. It has in Yerushalayim. One of the terrorists involved in the Har Nof massacre had met, two weeks prior, with one Jeremy Corbyn. On Nov. 5, 2017, Devin Kelley shot and killed 20 people in a church in Texas. He was an atheist who hated religious people. An intelligent person should recognize that there is less connection between the “right wing” and the “alternative right” (note the alternative) and the left wing and BDS and Islamic terror. Any suggestion otherwise is just gaslighting from the left-wingers who run the media. They also claim President Trump is a Nazi and a Russian spy. Nothing they say is credible, and shame on you for falling for it. Recently David Duke called Ilhan Omar the most important politician in the country. He knows that antisemitism exists mainly on the left. Let’s think about this. We Orthodox Jews take Torah seriously and know what that implies. There are also Muslims who take the Quran seriously, including all those parts that insult us and call for our enslavement and destruction. Muhammad himself was of this bent. Why would we expect such Muslims to do the objectively right thing when that contradicts the Quran? Maybe Muslims are willing to treat us properly only in proportion to their deviation from the Quran. As for interviewers, you left out the most common kind, who enforce affirmative action policies in the form of racial quotas that work to our disadvantage, no matter how the quotas affect employee productivity. Every incident in which an incompetent is hired because of a quota contributes to racial antagonism. People of color who can and do get in on merit suffer by association. Here is the difference. All the major religions have texts they don’t like to showcase in three-story letters in Times Square. Some deal with these texts through an interpretive tradition. Some by freely stating that the authors of those texts believed in those verses, but they no longer do. (Observant Jews have a hard time understanding that Catholics easily have that option, and employ it, without it destroying the backbone of their faith. Muslims were once into an interpretive tradition. Many still do. Additionally, the anti-Semitic verses in the Quran are offset by verses that are positive about Jews. (I once sat in on a class at San Diego State where a Muslim prof – observant, not secular – proved to his mostly-Muslim students that Israel belongs to the Jews. I have since encountered others who believe the same.) Those with access to interpretive tools have no problem resolving the conflict, and giving their followers a way to maintain their regard for the Quran without selling out, and at the same time allowing them to better “fit in” to their new host countries. Fitting in is not the best way to conduct theology, but is more widespread than people think. The problem is with literalists. All religions have them, but they are a smaller part of the population among Christians and Jews. Salafis (and similar), however, are huge among Muslims, and were given an opportunity to take over mosques and madrasas around the world by the royal family of Saudi Arabia – a move that the newer generation seems to regret. Salafis (or more accurately, Wahabis) have their rejection of traditional interpretation down to a quick phrase: “They were people, and we are people.” They scorn those interpretations. Simply open the Quran, they say, and take in what it says. Those are the people you have to watch out for. But it is important to remember that there are thriving populations of Muslims who have practiced a moderate religion for hundreds of years – Indonesia, for example. See what the Hudson Institute has to say about Pak Yahya, for example, whom I was privileged to spend time with in Jerusalem not long ago. Re Indonesia IIRC it is the largest population country in the world with majority Muslim population,India has the largest Muslim population of any country in the world. Islam is much more than a Mideast religion. Certainly pragmatically a reason to be careful not to encourage making disputes a religious one. Christians do not believe that Gospels were written by religions founder or God, traditional Jews believe Torah was revealed by God but simultaneously Oral Law was given and interpretation part and parcel of system, Islam believes it’s holy work was revealed to its founder thus the non changeable word of God. Of course, founders actions and customs secondary source. P.S. A very thoughtful piece. Hope it gets picked up. How many of those individuals who participated in vigils public pity parties and who can be counted on for attempting to neuter the specifics of anti Semitism would come to a hesped or public assembly that denounces anti Semitism as having arrived on the American shore or denounce BDS ss a threat to Israel? Toward the end of the book, the point was made that a text can be so twisted out of context and its normal meaning as to subvert it completely. The example given from antiquity was the Christian treatment of the Jewish Bible. We now see how antinomian Jewish movements attempt this, too. This is also what the Left has done to the US Constitution. you ask a question that has no answer particularly for a Divinely inspired text. Even what is to be assumed about a Divine text is argued as Prof. Hayes has shown. Our tradition, with the notion of an Oral law, has been historically most flexible among the three Abrahamic faiths. But precision is difficult if not impossible. I’m sorry to say, the above remark is extremely disingenuous, and reflects a gross ignorance of what is actually happening today in corporate America. For you seem blissfully unaware of the enormous amount of REVERSE racism going on. It is largely driven by billionaire liberal investors, Larry Fink of Black Rock only being the most guilty party. So far from the imaginary scenario you describe, it is far more likely today that the hiring manager is forced by the recruiter to interview at least one “diverse” (selectively defined) candidate, and then, in all but official written policy, also forced to hire such “diverse” candidate, without regard to actual qualifications . And like a child will keep pushing the envelope until he is forcibly stopped, this will keep happening until the Supreme Court stops it. People are slow to adapt, but money speeds them up. It is only a small matter of time before the Plaintiff’s bar apprehends the gold mine in class actions civil rights judgments that await them, which will dwarf the tobacco cases of the 90s. In short, you’re citing looooong out of date tropes, and missing developments happening NOW. Someone who fails to see the reverse racism (and the numerous other areas of forced liberalism and concomitant anti-white, anti-male, or anti-Christian sentiment) also fundamentally misses the Trump revolution and the transformation of America. You raise good points, but do keep in mind that not all jobs today are in corporate America. There are still lots of people applying for lots of positions outside of it. What you demonstrate is that there is no shortage of aggrieved parties today. But white grievances don’t cancel out black ones – especially if you happen to be black. I don’t agree. While not everyone will always like everyone, the Civil rights law was passed more than fifty years ago, the 13th Amendment more than 150. There are countless “affirmative action” and other enabling programs. Any black who wants to succeed today, can do so. By contrast, whites TODAY – not 150 years ago – are routinely discriminated against. And it is not done in dark corners of the country, but it is done in the open, by our highest institutions, and showered with applause by the media. The issue is not one of competing grievances, but of false moral equivalencies. We, who every day see the Israeli army equated with Arab terrorists, should know better. It has been half a century since the Nixon administration mandated the Philadelphia Plan requiring government contractors to hire minority workers. Arguably, goes back even earlier to JFK and LBJ who used the terms affirmative action , but Nixon first to successfully implement with teeth. “The gemara (Bava Metzia 32b) says that it is preferable to help an enemy load than to help a friend unload his animal (despite concern for the overburdened animal). The reason is to help work on overcoming the tendency toward animosity. We see then why the Torah mentioned an enemy; however, problems remain. Ba’alei Tosafot (Pesachim 113b) ask: if the enemy’s actions make him fit to be hated, why should one try to overcome his hatred, and if he should not be hated, why is the hatred treated as a normal thing?